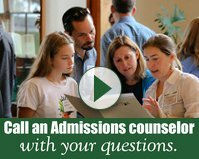 There are few people who have been a bigger cheerleader for Proctor Academy over the past sixty years than Artie Pratt '56, former captain of the Proctor football team. Not only has Artie hosted Proctor events at his home in Naples, Florida, championing all that is Proctor to anyone who will listen, but he has also shaped student lives on campus through his steadfast commitment to Proctor Athletics, and especially the Proctor Football program. 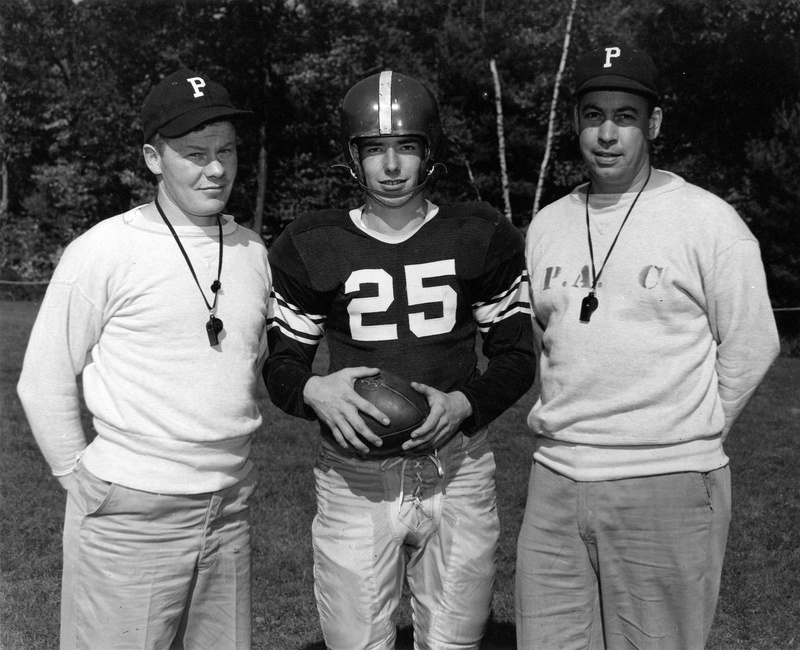 Under former head football coach Ben Rulli, the Artie Pratt '56 Teammate Award was established in honor of Artie, recognizing a member of the football team who exemplified extraordinary leadership qualities. 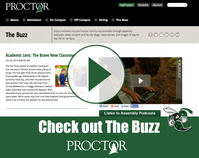 Rulli reflects, "From the instant I met him, I quickly realized his passion and love for Proctor. He was the type of person that made you feel like the most important person in the world at that very moment. From my first meeting onward I would continually speak with Artie at a minimum of once a month. His first question every time was, 'How are the boys doing?'. 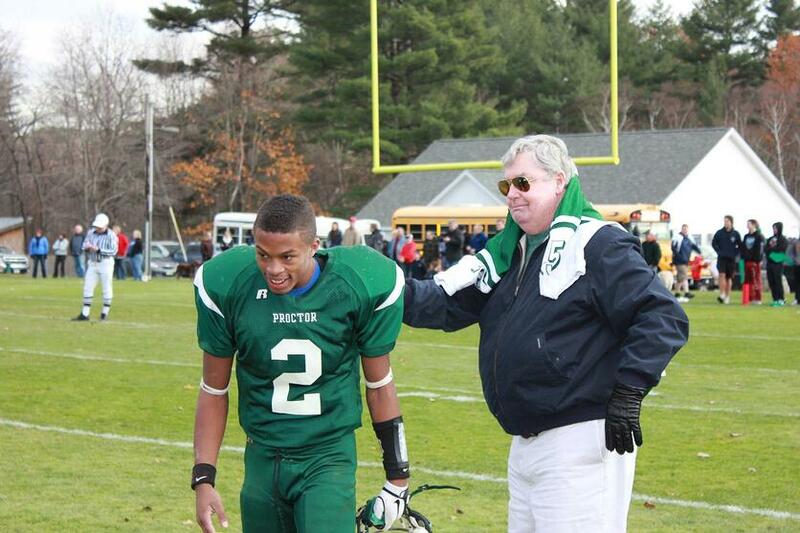 He cared so greatly for those around him and his passion for Proctor football rang through each conversation with him. As a football program, we wanted to honor Artie Pratt and our small token of appreciation was the Arthur Pratt Teammate Award first awarded in 2011. It is the highest award that a Proctor football player can earn." 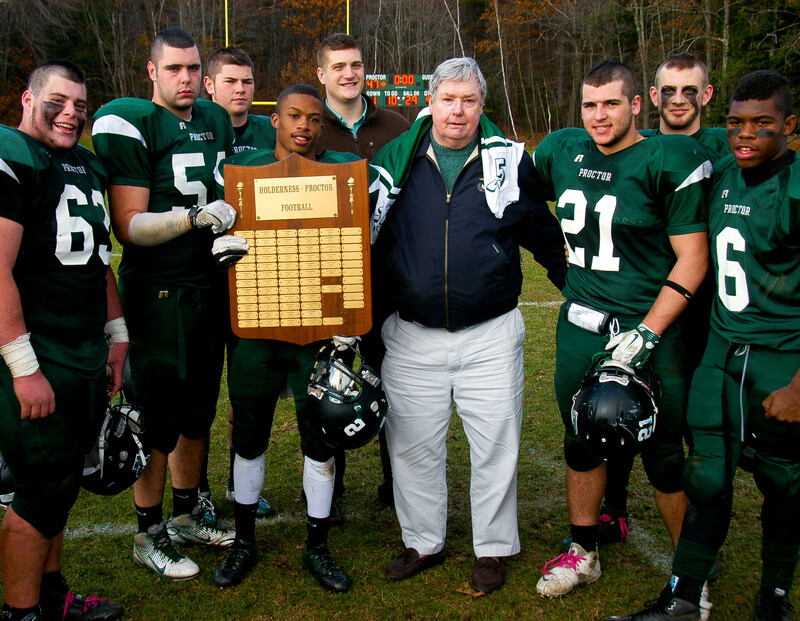 The first Artie Pratt '56 Teammate Award was given to Mike Lombard '12 who went on to play four years of college football at St. Anslem's College. Blake Joppy '13 (Springfield College/Salisbury College), Sam Barrett '14 (RPI), Calvin Johnstone '15 (Bates College), and most recently, Chris Agyemang '16 (Sacred Heart University) have followed. Artie made sure he connected with each of these young men as they were recognized with the award bearing his name. He made sure to email and call them regularly to check on their academic growth and leadership development on the field. Most importantly, however, he wanted to make sure they knew they had someone who not only cared deeply about their performance on the field, but in life. Mike Lombard '12: "Artie, To be the first recipient of your award is something that will forever tie me to you. I pride myself on being the best individual I can be every day with hopes of upholding the standard you set. You have followed me every step of my journey since I graduated from Proctor and I couldn't be more thankful for having you there. You never lost interest in my endeavors and have made a constant effort to stay in my life. I couldn't be more thankful for that. It means the world to me. Love you, Artie! You are in my thoughts and prayers. Be Artie Strong." Blake Joppy '13: "Artie, you've been an inspiration to me through your encouragement of me. I am so grateful for your presence at my final game as a senior. As my family goes forward in life, we will always remember you as someone who always looked out for us. Please know that through your involvement in Proctor and football, you have inspired me. I love you and God bless." 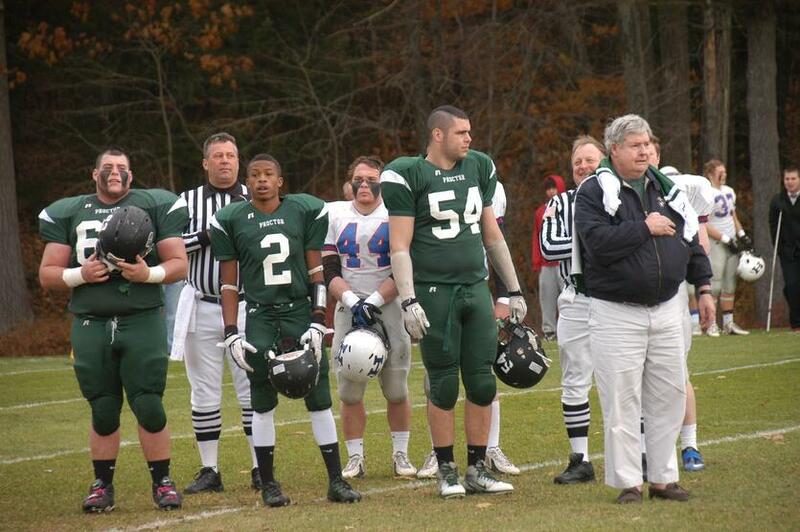 Sam Barrett '14: "Artie was a true supporter and lover of Proctor football. He bled greeen and white, and whether he was on the sidelines for a coin toss for the Holderness game or wishing us luck from his Florida home, we knew he would be pulling for the Hornets. Artie was not only our greatest fan, but a friend. Thank you for all you have given Proctor!" Calvin Johnstone '15: "Artie Pratt loves Proctor and believes that football instills work ethic and has the power to build confidence and character. His connection to Proctor football took various forms, including attending games, getting to know coaches and players personally, and staying in touch with us throughout our time at Proctor and beyond. Through the Artie Pratt Varsity Football Award, he has fostered a team culture that values integrity, academic excellence and leadership, including mentoring younger players and serving as a positive role model on and off the field. The Artie Pratt Award is an award of the highest honor as it is a privilege to know Artie and to enjoy his friendship and support throughout the years." As a former Marine, Artie is as tough as they come, but right now it is our turn to cheer him on as he battles health issues that are proving to be his toughest opponent yet. Artie, know you are in our thoughts and prayers. Thank you for all you have given to Proctor, for your endless support of Proctor, Proctor Athletics, and our football program. You are a shining example of what it means to be a proud alum of Proctor, and we thank you for the example you have set for all of us.